The demolition of a brutalist-era car park behind London's Oxford Street has been approved to make way for a hotel designed by Eric Parry Architects. Westminister Council has approved the demolition of the Welbeck Street car park, which was designed by Michael Blampied and Partners in 1971 for the department store Debenhams. It will now be torn down to make way for a 10-storey hotel with a spa, restaurant and roof terrace. Designed by Eric Parry Architects, the new building will feature a decorative facade created from ceramic tiles. 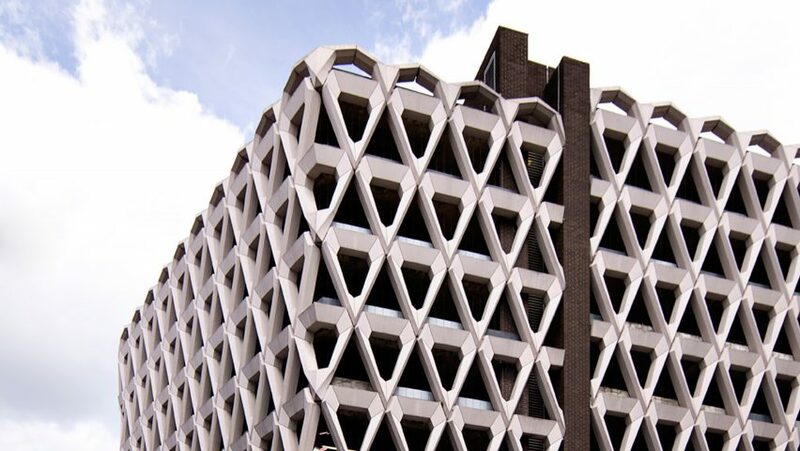 Welbeck Street car park, which features a diamond-patterned facade made up from prefabricated concrete, is the latest in a spate of mid-century buildings facing demolition in the UK. There were a number of objectors to the demolition. "Quite how this building can be described as bland, uninspired, lacking historic or aesthetic value is totally beyond me," commented one objector on the online planning portal. "Yes it may need a clean and the ground floor levels have not been looked after but look up! This building is stunning." Meanwhile, neighbouring members' club, the Oriental Club, protested that the height of the proposed hotel would block sunlight from its premises. The car park was denied listed status by the government heritage body Historic England, and was put up for sale by previous owner LaSalle Investment Management shortly afterwards. It was sold to developer Shiva Hotels in a reported £100 million deal in 2016. Dezeen columnist Sam Jacob once named Welbeck Street as one of the most important unsung buildings in the capital. "It is part of a small gang, a batch of buildings produced in a small window when car parks were treated as civic monuments, significant structures that expressed the modernity of the moment," said Jacob. Icon magazine recently featured the building on the cover of its June issue, which explored the golden age of transport. In the issue, editor James McLachlan said the building "equals the sci-fi brutalism of the celebrated Preston bus station". But Westminster planners said its demolition complies with the move away the use of cars in central London. "The loss of the existing public car park complies with transport policies and the principle of hotel use is acceptable in land use terms," reads the planning committee report.